What is an Online Pay Option? We all increasingly live in an online world, often to our chagrin, but it is a fact! More and more Canadians who are reaching retirement age or have recently retired regularly use online services, social media, and Internet news sources, often to the exclusion of traditional sources of information or purchasing goods and services. A survey of our members, conducted in August 2015, revealed that at least 20% of our members wanted to have an online payment option for Club services. Our Club is based on the use of an Internet website, Google cloud storage of data, and Gmail services to manage our Activity Group membership activities. Adding an Online Pay Option, quite simply, gives our members an additional way of paying for Club services, like Annual Membership renewals, "tickets" to special events, and so on. No one has to use it, and all are most welcome to continue paying with cash (at a Club meeting) or by cheque. All members using the Online Pay Option recognize the Club is charged a fee for each online payment received, which will normally be passed on to the member using it, and this is the case with all online merchants who accept credit cards. The purpose of setting up a Club PayPal account is to provide an easy to use Online Payment option to Club members who are being invoiced for special Club events or for memberships and renewals. Members using this service DO NOT have to be PayPal members to pay a Club invoice at the PayPal site, but can proceed and pay exactly as they would at any online retailer accepting credit cards. ​not have to be provided to every online merchant a user purchases from. 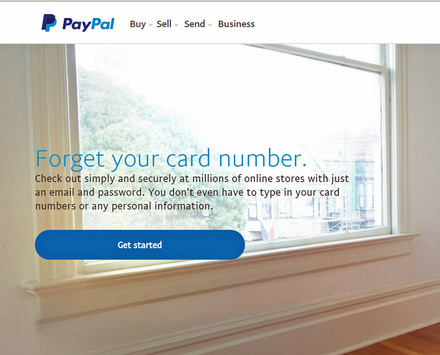 Is PayPal safe and secure to use? in 2002 and helped propel Ebay to become one of the most successful companies on the planet. Disclaimer: The Glacier Probus Club is providing this option and information as a service to our members, and does not specifically recommend that our members join or do not join PayPal or use the PayPal payment option. Is there a fee for using PayPal? Glacier Probus Club has set up a PayPal Business Account and registered our bank account where funds will be deposited. PayPal Canada is separate from the US PayPal and all transaction are in Canadian dollars. There is a 30 cents PayPal usage fee for each payment processed as well as a standard Credit Card company transaction fee for Invoice ​payments of 2.9%. This means that for a club event (such as the annual PRISMA Cruise) the ticket price of $25 could be paid in cash or by cheque for $25 or processed through our online payment system for $26.06. Management Committee have made a decision that the Online Pay Option is available for our 2016 - 2017 membership renewal and the Invoices will be for $30, the Club will absorb the PayPal fee (i.e. For a $30 annual membership renewal, $1.17 will be deducted from the payment, and $28.83 will be deposited in the Club’s bank account). 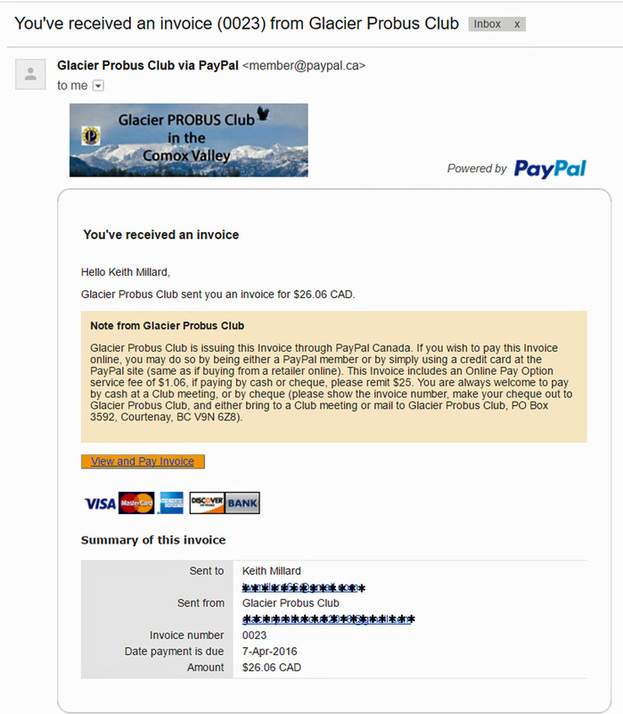 What does a Glacier Probus Club invoice look like? An Invoice for some Club events (for example, annual Membership Renewal) will be emailed to members, and will look similar to the example below. Members are most welcome to pay the Invoice by cheque and mail it to the Club address, as they do at present (but are asked to show the Invoice # on the cheque). To View the Invoice, simply click on the View and Pay Invoice "button" to see all the Invoice details (and to Print, if desired). To pay online, the club member simply clicks on the Pay Now button which will take them to the secure PayPal website, where, if they do not have a PayPal account they can simply enter their credit card information and Check Out, or if they do have a PayPal account they can simply log in and choose whatever method of payment they have set up as they Check Out.